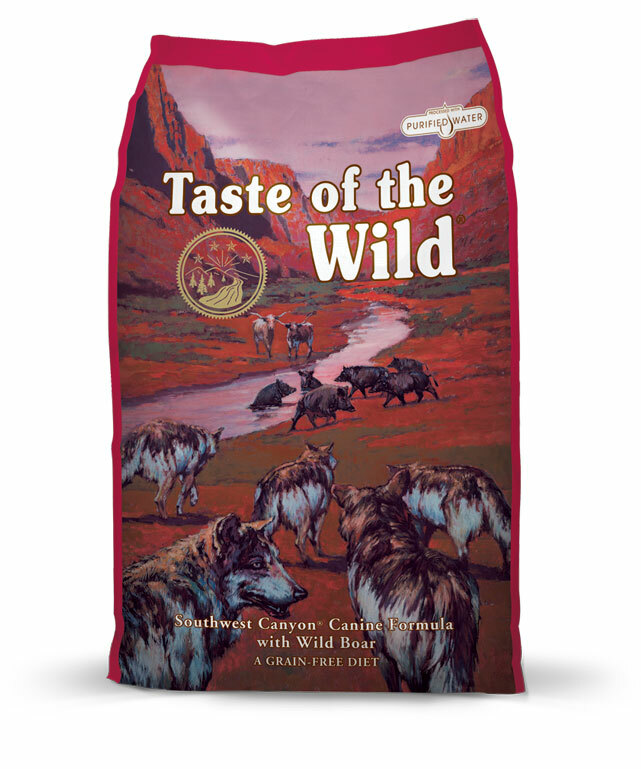 Taste of the Wild Southwest Canyon Canine Recipe is formulated to meet the nutritional levels established by the AAFCO Dog Food Nutrient Profiles for All Life Stages including growth of large size dogs (31kg. or more as an adult). A truly unique protein with a truly unique taste, wild boar makes this recipe perfect for dogs who crave something different. In addition, nutrient-rich legumes and fruits like peas, garbanzo beans, blueberries and raspberries provide antioxidants for overall health and vitality. Unique Protein Blend – A hearty blend of beef, lamb protein, eggs and wild boar provides complete protein nutrition with a rich, meaty flavour. DHA – This omega-3 fatty acid, provided by salmon oil, helps support brain and vision development in puppies, which makes it an important addition to this all life stages formula. Garbanzo Beans – Rich in protein, minerals and fiber, garbanzo beans add a host of nutrients to this grain-free formula. Dried Chicory Root – This source of prebiotic fiber provides fuel for the beneficial probiotic bacteria in the digestive system. Antioxidants - Legumes and fruits, including peas, tomatoes, blueberries and raspberries, provide nutrients that help support your dog’s overall well-being while guaranteed levels of zinc, selenium and vitamin E support the immune system. For pregnant or nursing adult dogs, we recommend free-choice feeding. Some dogs may require more or less food than the guidelines depending on activity level and other factors. Changing Food: For 7 - 10 days, gradually decrease the amount of current food while increasing the amount of new food.